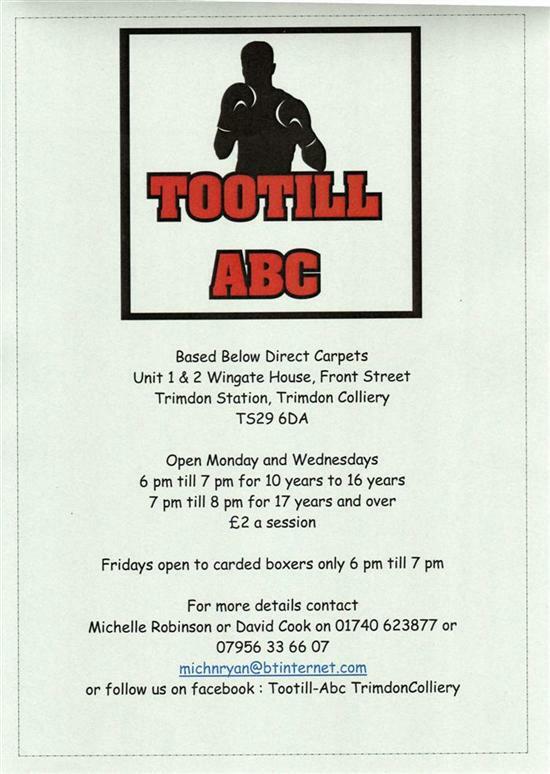 We have registered with the Tyne Tees and Wear Amateur Boxing Association for the upcomng season which starts September 2011. Last season saw 103 lads come through our doors, 15 lads passed medicals and had bouts for our club. The Season ended May 2011. We had 18 bouts with 6 wins, of these the ref stopped the contest twice. We have registered this upcoming season seven local lads, all from the Trimdon, Wingate and Fishburn area. Jordan Young, Jordan Armstrong, Lewis Crowe, Darren Fox, Luke Chapman, Tom Summerbell and Daniel Pettler. Last season the club went through so much, being put together then losing an excellent coach and leader Alan Robinson. I have had to learn a lot about boxing and running a boxing gym, and I would like to think we are going to improve our winnings and make Alan and everyone proud, but above all have fun, to train hard, and fight easy.